Here I am, a new blogger. This blog will follow my journey as an artist, naturalist, outdoor lover, workshop teacher and life-long learner as I travel my road. First and foremost I am an artist living near the shores of Lake Superior, the largest fresh water lake in the world . I have been making art for over 40 years and as an artist my landscape paintings and drawings strive to capture our Natural Spaces and Wild Places, hence the name of this blog. 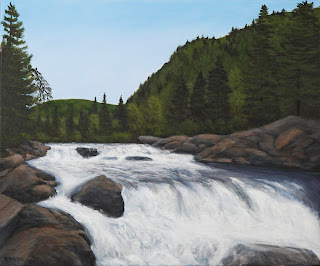 I will demonstrate or describe how I do what I do, show you the places I paint and provide enough information so that an artist can follow what I did and a viewer or collector can understand why I did it. It should be fun, entertaining and informative. I paint in acrylics and watercolours, usually on canvas now but I use to paint exclusively on masonite. 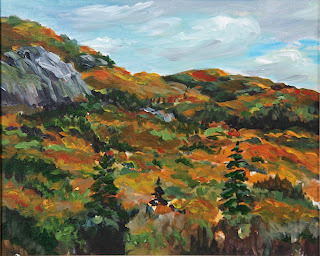 I liked the smooth surface but I found that canvas allowed me to loosen up my work and to get a more painterly approach. The work on the right is called " Master Of His Domain" 20"x24" and it depicts a waterfall that that I have painted twice now. It's located about 45 minutes outside my home town and can be a raging torrent or a smaller cascade depending on the weather and snow melt in the spring. 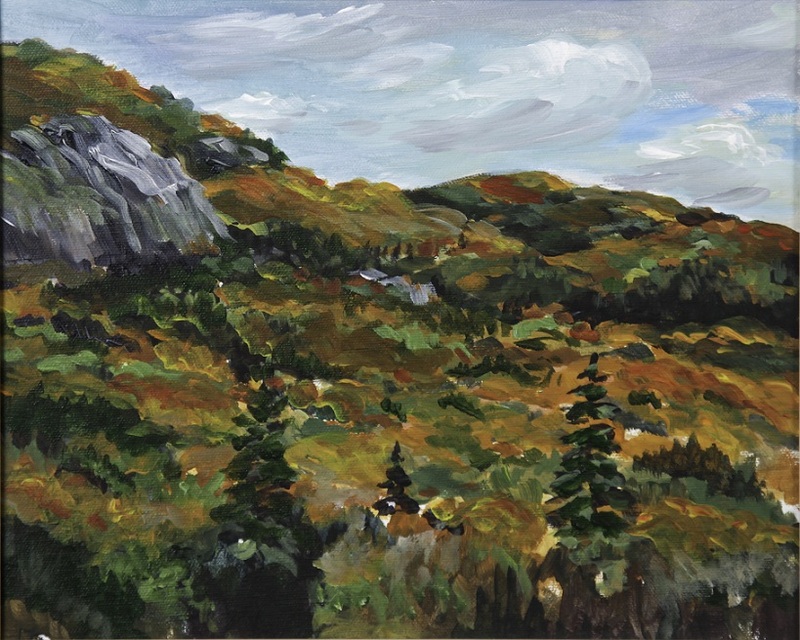 I have a home studio that suits my needs but I love to get outdoors to paint "en plein air". I paint more directly with a loaded brush and limited palette as can be seen on this example below. This is acrylic, 10"x12" on masonite. I usually paint on this board outdoors as it provides a strong surface to take some of the transportation punishment they get and I like being able to cut it down to various sizes. I double coat these with gesso an sand to a fairly smooth surface. I will be posting details on my techniques and showing pictures of the places I visit, sometimes with my wife and two dogs. There you have it. Time to see if I can get my settings on the blog right! Great Job! I loved the story you told about your work.